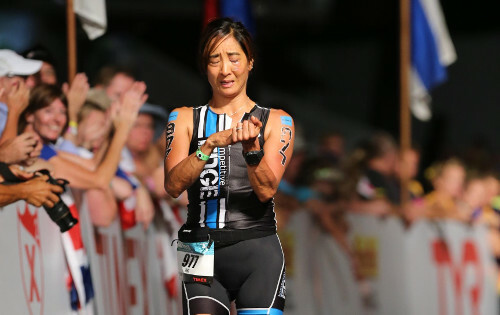 Heading into Kona I knew my fitness wasn’t where it was at compared to just a few months ago. I wanted to have a solid race but I knew it wasn’t going to be a PR. I felt good about my run and swim but the bike would be the question mark. This season has gone perfectly. Everything happened the way I planned. I just had one more race to end the season. 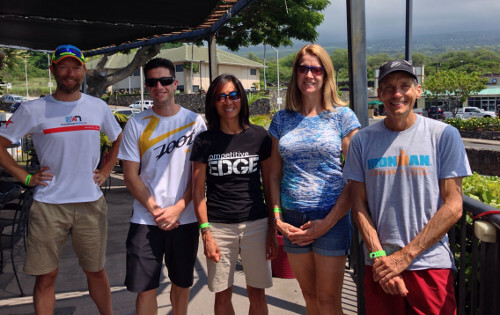 Unfortunately everything unraveled in Kona and the wheels came off. 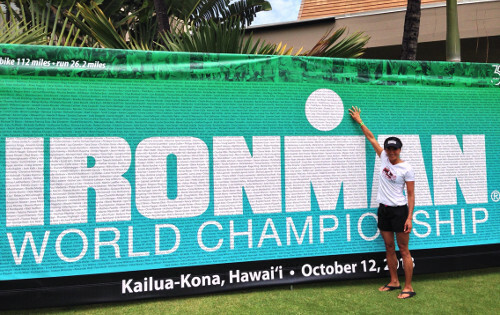 I arrived in Kona a week before the race with Stephanie Stevens and Scott Dinhofer. I did some swimming, biking and running leading up to the race. On Friday there was an EN team breakfast with Dave Tallo, Kate Leary and her husband Joe, Matt Ancona, Tim Cronk and Heather Webber, Steph and Scott. After breakfast I checked in my bike and gear bags. Then it was back to the house to relax. I was asleep by 9:30 pm but was up early at 2:30 am. I stayed in bed until 4am before getting up and having breakfast. For breakfast I had a bowl of steel oats with almond butter and some almond milk, a banana and a chocolate UCAN shake. Scott dropped Steph and I off and then went to park the car. I arrived at the host hotel shortly after 5 am and went straight to body marking. This year instead of stamps they used tattoos. After body marking you had to check your timing chip, get weighed and go through several security points before you entered T2. The person next to me was using a bike pump so I helped her pump up her tires and then she helped me. I put my nutrition on my bike, turned on my Garmin 500 and calibrated my Quarq power meter. I tried on my helmet to make sure it fit right and then put it back on my bike. Steph’s friend, Stacia from Colorado was a few bikes down. We met for the first time this morning. I tried to help her put air in her tires but we were having trouble with her rear tire so she took it to the bike mechanic while I went to put a few things in my bike and run bag. Around 6am we excited transition and went to the front of the hotel to meet up with Steph and Scott. We waited on the grass until the pros started at 6:30am. Then we made our way into T2 to enter the water. This year I made sure to use extra Aquaphor. Last year I was so chaffed from the bike that it was a painful shower after the race. I was not going to make that mistake again. Swim – goal under an hour. I lined up close enough to the pier so that I could see Mike Reilly’s face. 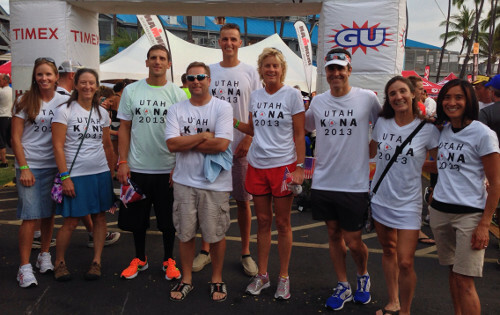 Last year I took a beating at the start and for the first time I experienced anxiety during a swim start. I knew there was a good chance of that happening again. Although it feels like forever it’s only a few seconds and it’s worth it. There was still 15 minutes to the start but people were already pushing forward and it was getting too crowded. I saw some other pink caps to the left of me so I moved over a few spots. The canon went off and it was a smooth start. There was contact but it wasn’t bad. We were on the buoy line right from the start and stayed there the whole time. There was always someone on both sides on me. You could tell when we were getting close to a buoy because it got more crowded until we passed it. Last year on the way back to the pier it was more spread out. This year I was in a big pack so I thought I was having a mediocre swim. Oh well, it is what it is. Once we hit the pier we spread out so it felt like the current was stronger since we weren’t all bunched together. The short distance from the end of the pier to the beach seemed to take forever to go a short distance. I swam until my hands were touching the sand so I didn’t have far to run to the stairs. As I was going up the stairs I was unzipped my swim skin and started to take it off. I made sure to rinse off good under the hoses to help prevent chaffing on the bike. As I ran to my bag I pulled my swim skin down to my hips and took off my cap and goggles. A volunteer had my bag ready and then it was into the changing tent. A volunteer emptied my bag for me. I took my swim skin off, grabbed my shoes and stuffed a flask into my back pocket. It didn’t take long at all before I was running out of the tent and to my bike. I saw Steph, Scott and the Ashworth’s as I ran to my bike. At my bike it was shoes on the ground and I put them on while putting on my helmet. I secured my shoes before getting my bike and then I was out of T1 and onto my bike. The first part of the bike was different from last year. It seemed like everything else was the same so I’m not sure what was cut out. Once out on the bike I was immediately being passed. It’s not a good feeling. But as Tim said, that’s what happens when you get out of the water ahead of all the Über bikers. It still doesn’t make it an easier on the psyche. I let it get to me and I mentally checked out on the bike. I’m not sure where it happened or if it was gradual. On the way back on the Queen K we had a headwind. The headwind didn’t help with my state of mind. I didn’t care about staying aero going up the rolling hills. My legs were a little tired but not bad. After the airport the headwind let up and I road better the rest of the way into T2. I took my feet out of my shoes before T2 so I left them on the bike. Took my helmet off as I ran to get my run bag. Then it was into the tent. A volunteer helped my into a chair and put a wet towel on my shoulders before she left to help someone else. I forgot to ask for sunscreen so it could be applied while I was in the chair putting on socks, shoes and race belt. Since I had to wait for sunscreen I put on my sunglasses. 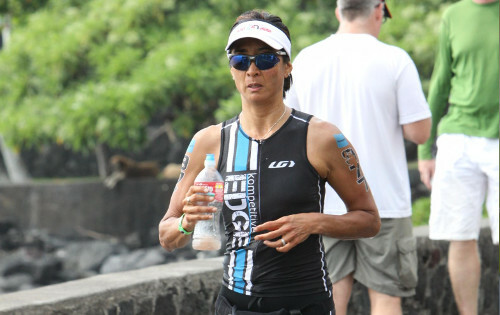 While I was running out of T2 I put on my visor. My legs felt okay getting off the bike. I saw Steph shortly after exciting T2. My mind wasn’t in a good place so when I saw her I stopped and just broke down. I knew I was going to finish but it was going to be a mental struggle unless I regrouped. I started running and the crowds in town were awesome. You can’t help but draw energy from them. I had my watch on but I didn’t even want to look at it. I didn’t care about my pace at this point. I saw the race clock when I exited T2, if I just kept running a steady pace I would be okay and finish faster than last year. Each aid station is more spread out than normal. I would run through the first half of the aid stations getting water and sponges to pour over my head, ice to put down my tri top and then get a cup of perform at the end before I started walking. Last year I spent too much time walking at the aid stations so I needed to change things up to cut down on the # of steps. I made sure I thanked the volunteers. They did a great job not only on race day but during registration and bike check in the day before. I made sure I enjoyed myself on the run. That was the only way I was going to make it through the rest of the day. I felt a little bit a tingling in my hands but nothing bad or anything to be worried about. I made it through the out and back on Ali and through town before walking up Palani. Then it was out onto the Queen K. This year they weren’t allowing people on the Queen K to go out to the entrance of the energy lab. There weren’t many people out cheering. I was doing okay at the beginning of the Queen K but then about 3 miles in, the tingling started getting worse in my hands. Not a good sign considering I still had a long way to go. I started walking to see if it would get better. I thought I was dehydrated so I started taking 2 cups of perform at each aid station. There were several people that tried to get me to run. One was going the other direction, another was someone I had met on Ali Drive and had run with earlier and then someone who even waited for me at an aid station to catch up. It was great. My legs wanted to run but the tingling was still there. It never completely went away. When it was better I ran but as soon as it started getting worse I had to back off. At the start of the Energy Lab, Stacia passed me. I tried to run with her but I couldn’t. It was frustrating. She got a little ahead of me and I just pushed myself to run so I could take advantage of the downhill. I was walking again coming out of the Energy Lab when I met this guy who was walking. We worked together to start running aid station to aid station. I thought we were going to make it to the finish together. It was good to have someone to talk to. Found out that he bought his slot on eBay and is a motivational coach for CEO’s. He told me f I needed any motivation to just let him know. Where was he during the bike when I needed the motivation? 2 miles from the finish and the tingling was back again and it was bad this time. I had to let Mark go on without me and he said I’ll see you at the finish. At the top Palalni I was in bad shape. I passed the last aid station before having to stop. I must have looked pretty bad because a racer who was walking with his family back to the car came over, put his arm around me and encouraged me to start walking. We almost made it to the bottom before I just had to stop again. He asked someone that was spectating if they could walk with me to the finish as he needed to get back to his family. At that point I just needed to sit down. Several more people gathered around me along with 2 police officers. They called for medical. I was less than a mile from the finish. People were telling me I had 4 hours to finish, plenty of time. The cramping started in my hands and it wouldn’t release. The tingling was on my face and my mouth was starting to go numb. I asked a lady if she could call Steph because I knew she was waiting for me at the finish. I had her number in my race belt. Someone told her she couldn’t touch me or I’d be disqualified so she didn’t call right away. When medical came, this got clarified and she was able to get the number and call. The support was great. I had people getting me Gatorade and chicken broth from the aid station at the top of the hill. Someone even asked if I wanted a cold soda from Taco Bell. Medical never talked about pulling me from the race. It was all about what can we do to get you up and walking again. I was hyperventilating due to the situation. Someone had a paper bag that smelled like chicken but it was all that was available. Medical had me breath into the bag. She kept apologizing for it smelling like chicken. It was good when Steph arrived. I was there for a long time and the cramping kept getting worse, especially in my right hand. The numbness on my face made it hard to talk but it gradually went away. I was so grateful there was never any talk about pulling me from the race. I would have fought hard on that issue. Finally medical suggested I stand up and make small goals to get moving forward. Steph and the gal from medical supported me at first as we walked toward the stop light which was only a few feet away. Then it was to a street sign, then another. My legs were fine but my right hand was still cramping. I had to use my left hand to push back on the fingers of my right hand to keep it from contracting into a fist. Two of the guys that had stopped to help on Palani continued walking with me along with Steph, medical and Scott. A camera man started following us and shinning his light in my face asking me questions as we walked. They stayed with me as long as they could. The crowd on Ali was AMAZING! I tried to take it all in. I saw Tim and Heather before I entered the finisher chute and got a hug from Tim. I was never so glad to see the finish or more thrilled to hear Mike Riley call out my name. 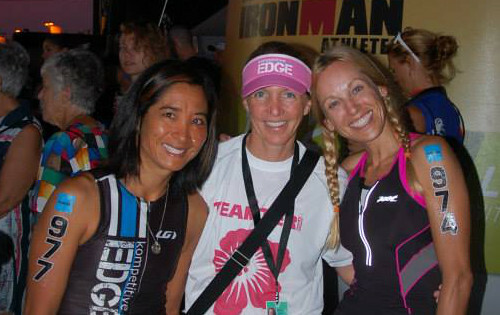 It wasn’t the finish that I had envisioned but it was just as rewarding and memorable. Thank you to all the people I encountered during the race that helped to get me to the finish line. I was amazed by the support I received as people were facing their own struggles. Especially to those, who stopped to help me when I was in distress. I will never know their names but I will pay their kindness forward. I went straight to medical after finishing. The cramping was some of the worst they’ve seen. It wasn’t just my major muscles; it was all the small ones as well. They were easily able to get IV’s in both arms. They started a 750ml bag of IV fluid (stopped it with 300ml remaining). They drew some blood and gave me some magnesium through the IV too. The cramping would not ease up so they gave me a small dose of versed. I was immediately able to relax. The blood work came back and showed that my potassium was low at 2.8. Normal range is 3.5 – 5.2. They didn’t have any potassium in the med tent so it was off to the ER. Before this race I changed my hydration to one that had more potassium than Perform. I’ve had tingling in my hands and feet previously, but not until after finishing. I started using OSMO hydration several months ago, so this was not something new. I used some in Lake Placid to start the bike and run. I don’t know what went wrong, if it was a combination of things or only low potassium. I will need to figure this out in the off season so I’ll be ready for next season. Steph’s Sherpa duties were phenomenal all week. I’ve been lucky to have her with me the past 3 years as we’ve traveled to races together. It was good to have her and Scott around all week and I was lucky to be surrounded by positive. Last year after I finished I immediately knew I wanted to come back. It was an unbelievable experience and it’s the World Championships. I want to go back again, but for slightly different reasons. I have unfinished business. This year the island got the better of me…..next year will be a different story.